Oscar nominated French filmmaker Julien Magnat (student short: The All-New Adventures of Chastity Blade) makes his ambitious if ultimately awkward English language feature debut with this clunky thriller that destroys the promise of its clever premise with logic that’s so laughable that it leaves holes big enough to drive the strained script through. Bolstered by a solidly constructed foundation and anchored by the commitment and conviction shown by actress Milla Jovovich’s strong performance, writer/director Magnat’s easily predictable yet uneasy serial killer mystery is unfortunately bogged down by a crowd of unlikable characters – most of whom behave in the most mind-bogglingly bizarre ways throughout. Although she manages to survive her wrong place/wrong time encounter with multiple murderer Tearjerk Jack – becoming the case’s first official living witness who’s seen the blade wielding psychopath – Jovovich’s sweet schoolteacher discovers that instead of mere Post-Traumatic Stress Disorder, she’s developed Prosopagnosia or Face Blindness, making the faces of friends, lovers and strangers all swirl together in an unrecognizable blur. Facing an uncertain fate with the realization that the killer could be right in front of her at any given moment with the cool confidence that the heroine wouldn’t know him from Adam (or actually anyone), although Magnat’s movie offers a smart twist on the blind terror subgenre best epitomized by the classic chiller Wait Until Dark, Faces in the Crowd never fully pays off on the plotline he’s attempted to set-up. From failing to make us believe that the only viable lead to catching a serial killer wouldn’t qualify for police protection because of paperwork to sending our heroine out to meet an estranged lover late at night after she’d been purposely placed in hiding, Magnat distracts us from his ingenious premise with illogical behavior and an alarming lack of common sense. Moving beyond out-of-character behavior to flat out idiocy, although it’s ripe for rotation on Lifetime as a woman-in-peril thriller, Faces in the Crowd may also have a future as RiffTrax fodder in the future as we endure all types of head-scratching moments from start-to-finish. 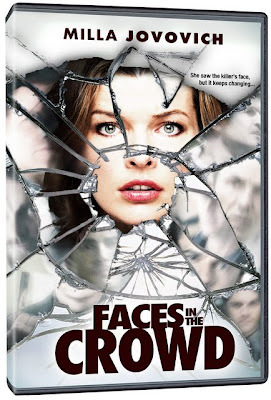 While Faces is several steps above a run-of-the-mill made-for-TV mystery, mostly due to a strong emotive turn by Jovovich who keeps getting better with each and every role, sadly when you place Magnat’s picture alongside other English language feature debuts – much like a room of faces in the onscreen crowd – our memory of it will be little more than a blur.